As we enter the rainy season there’s going to be a lot of rain, and sometimes that can be a bit miserable. But what if every time it rained you got to enjoy an interesting water feature? 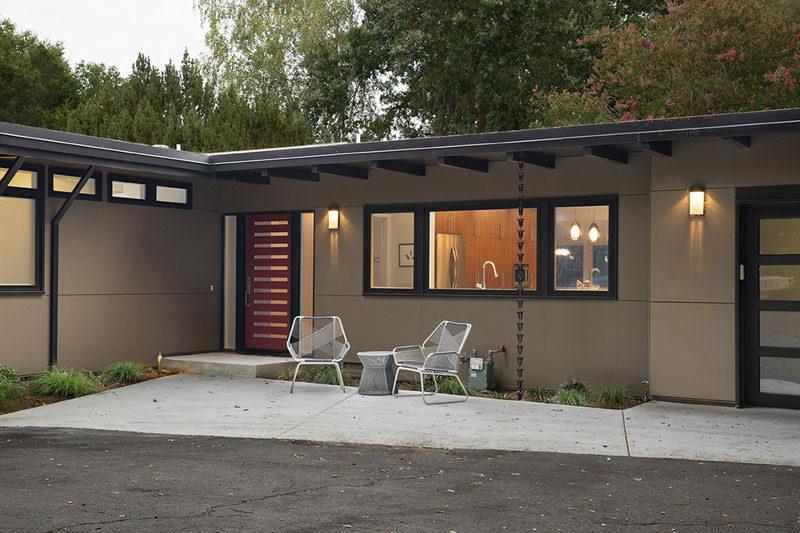 Rain chains are a great way to add a unique design detail to your home and help direct water away from the foundation of your home, preventing it from weakening over time. So not only will you have a beautiful water feature every time it rains, you’ll be protecting your home from water damage! 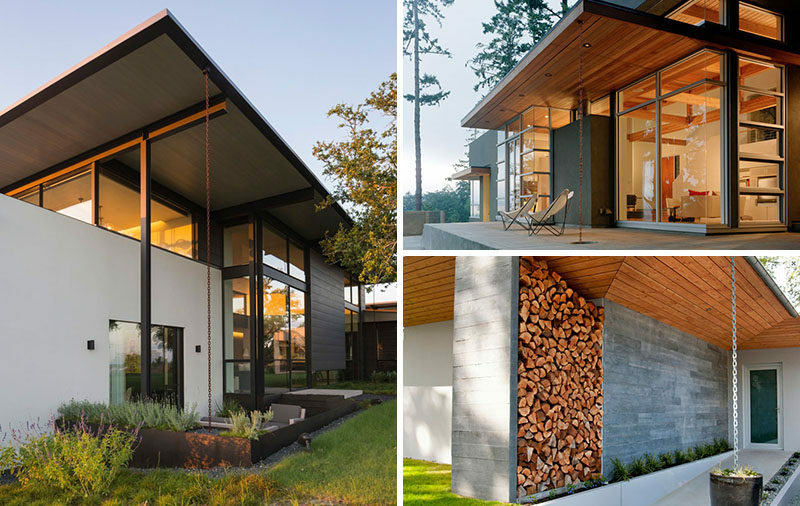 To give you an idea of how a house can look with one, here are 14 modern examples of rain chains. 1. 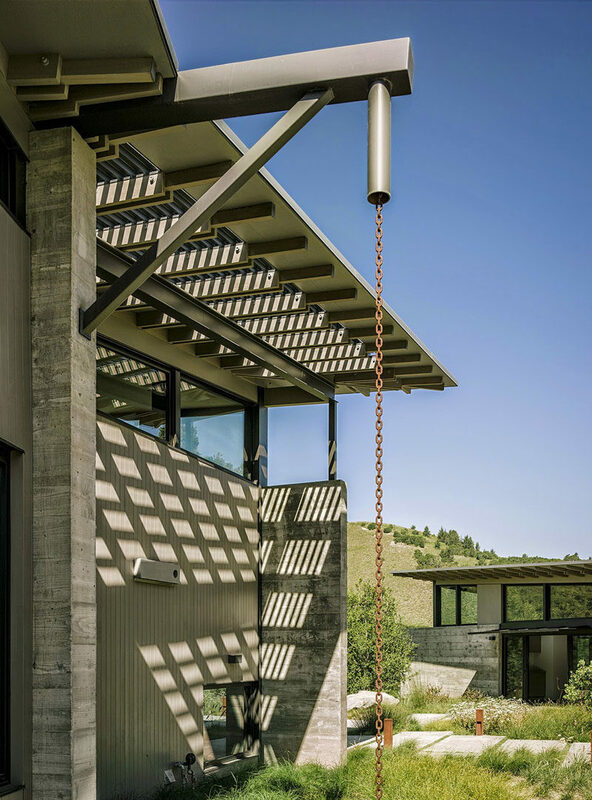 This rain chain has a design reminiscent of an oil pulley, creating an industrial look. 2. This rain chain has mini buckets on it that overflow into each other as the rain pours down, and guides the water into the small garden bed. See more photos of this house, here. 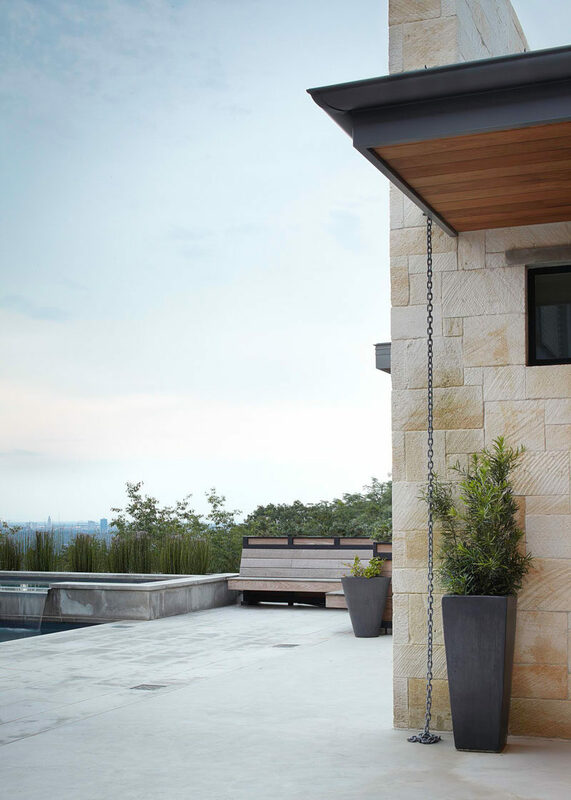 Designed by Klopf Architecture, landscaping by Envision Landscape Studio. Photography by Mariko Reed. 3. 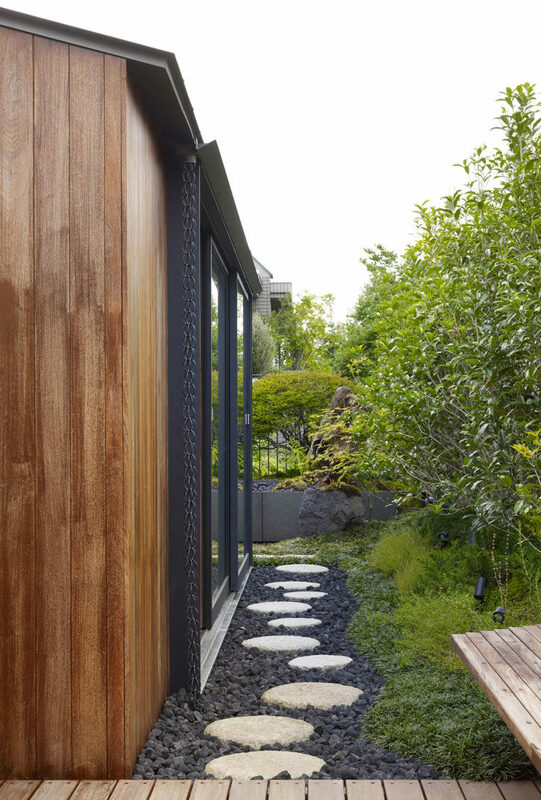 Sitting right at the front door, this rain chain made from a single black chain directs water away from the foundation of the home and creates a nice water feature when it rains. See more photos of this home, here. Designed by Jørgensen Design. Photography by Joe Fletcher. 4. Multiple chains hang from this roof and guide water into small garden keeping the plants well watered. See more photos of this home, here. Designed by TSC Architects. 5. 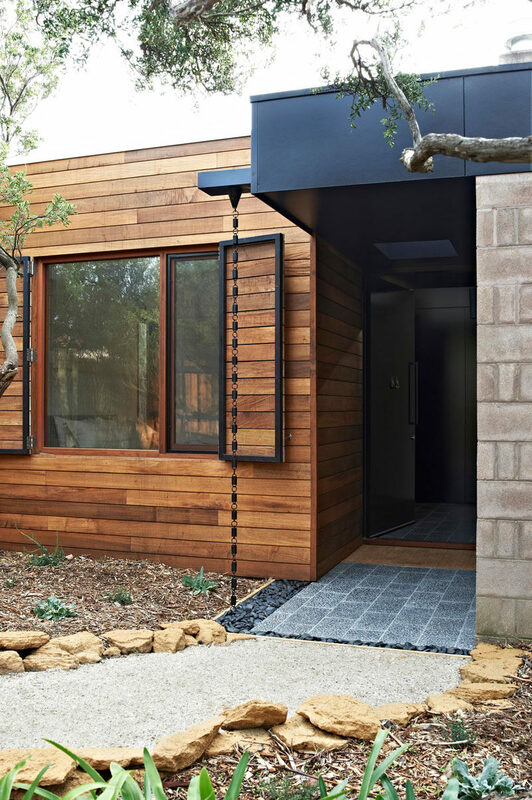 A chunky black chain carries rain water into a bed of rock at the front door of this home creating an industrial look as you walk in. 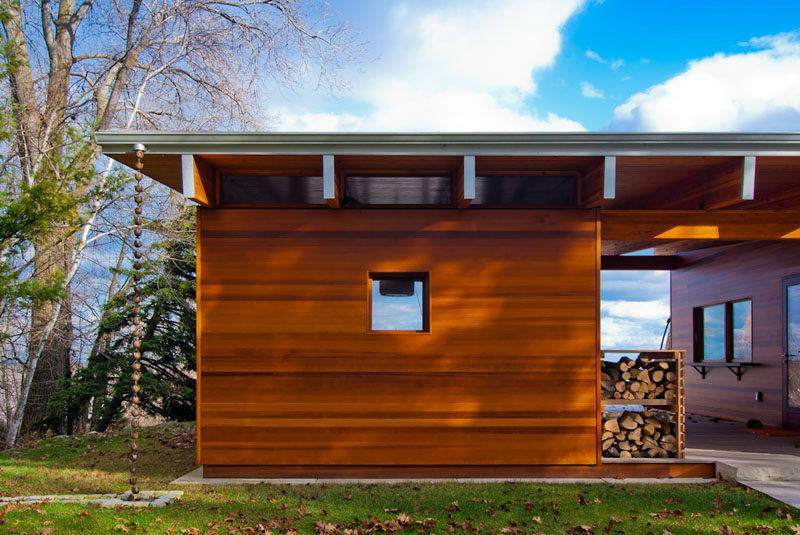 Designed by Bower Architecture. Photography by Nikole Ramsay. 6. 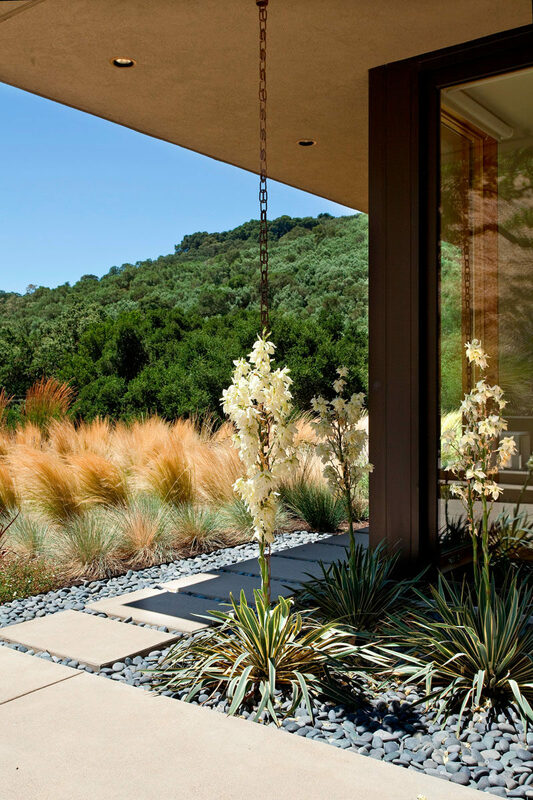 This decorative rain chain is made of metal flowers that overflow with water and carry it away from the house as it rains. See more photos of this home, here. 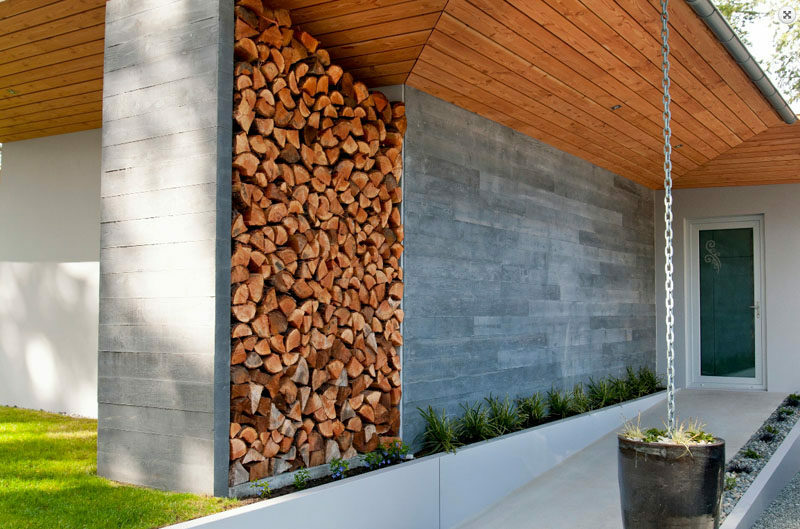 Designed by Ramsey Jones Architects. Photography by Daniel Kabara Photography. 7. 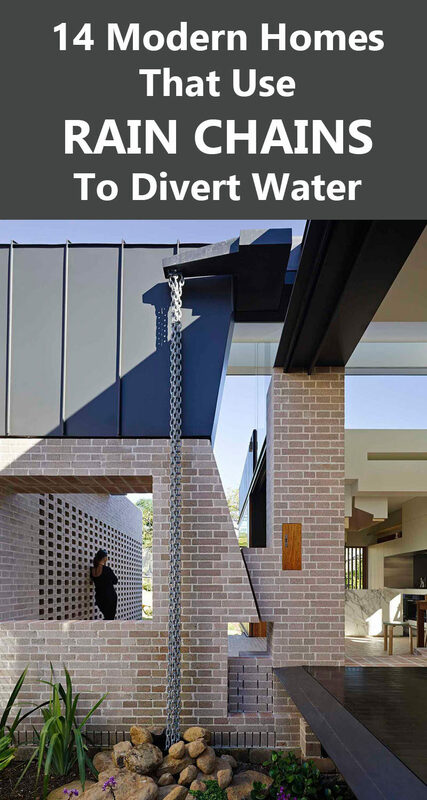 Multiple chains hang in multiple places around the exterior of this home, helping to disperse the water as it falls and prevent it from pooling in one place. 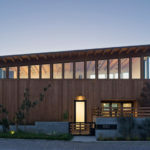 House designed by Rural Office for Architecture. Photography by Ionana Marinescu. 8. A number of chains hang from the roof of this home and guide the water into drainage disguised by a pile of rocks. 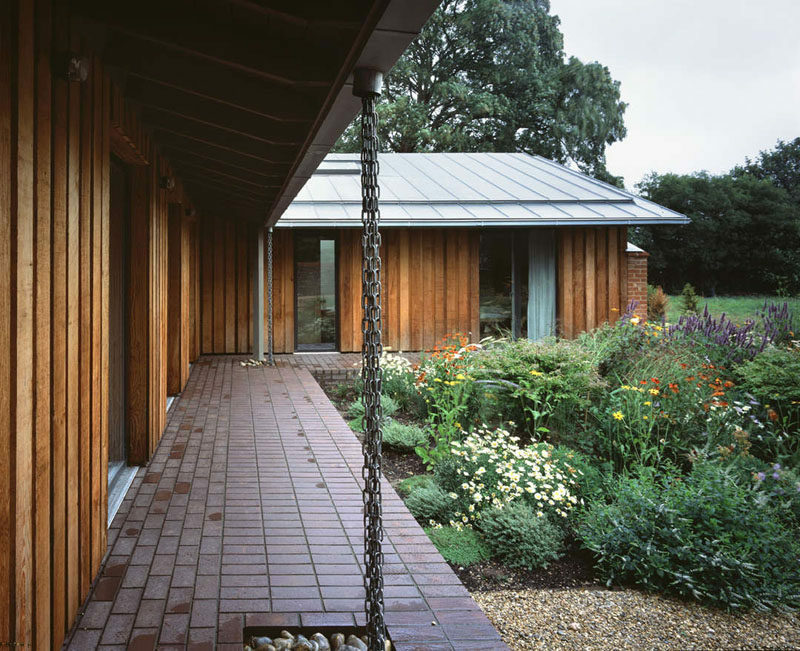 House designed by Cox Rayner Architects and Twofold Studio. Photography by Christopher Frederick Jones. 9. Two chains direct water into the rocks beneath them on each side of this home. 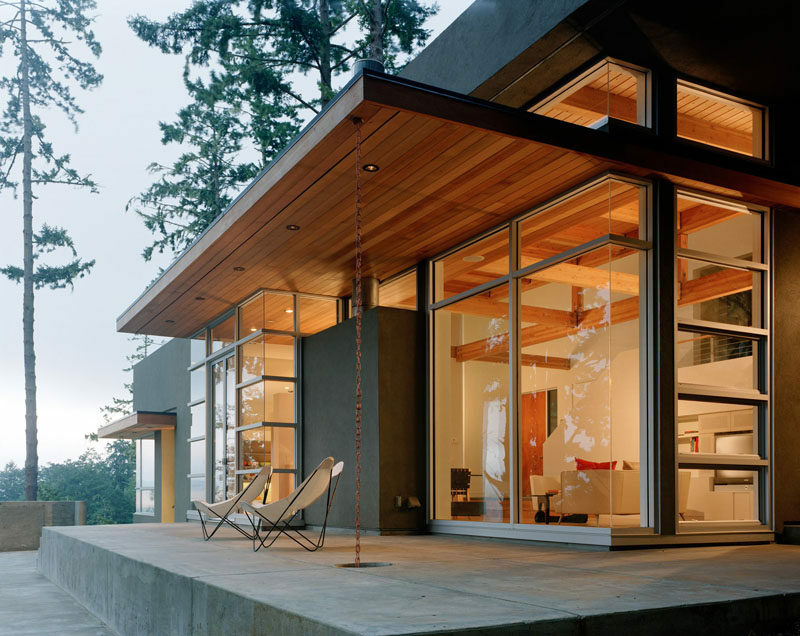 Designed by Lake | Flato Architects. 10. 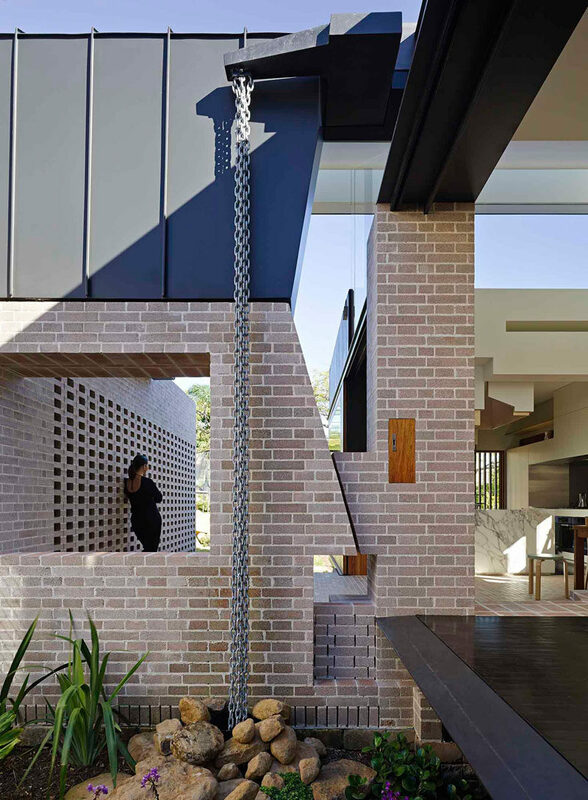 This rain chain, made from a traditional chain, is hidden next to the extended window frame on the side of this house and guides water in between the rocks of the footpath. See more photos of this home, here. Designed by Keiji Ashizawa Design. 11. 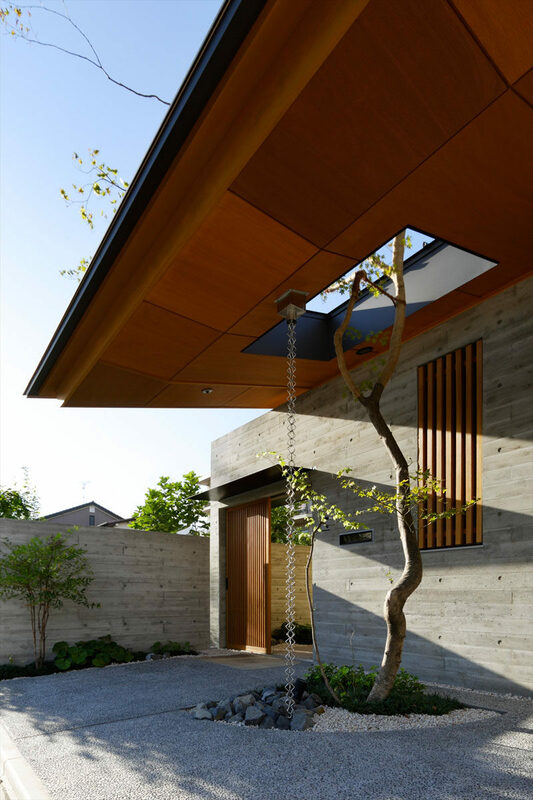 A single chain hangs down from this roof and gathers at the bottom to let the water flow freely away from the house. 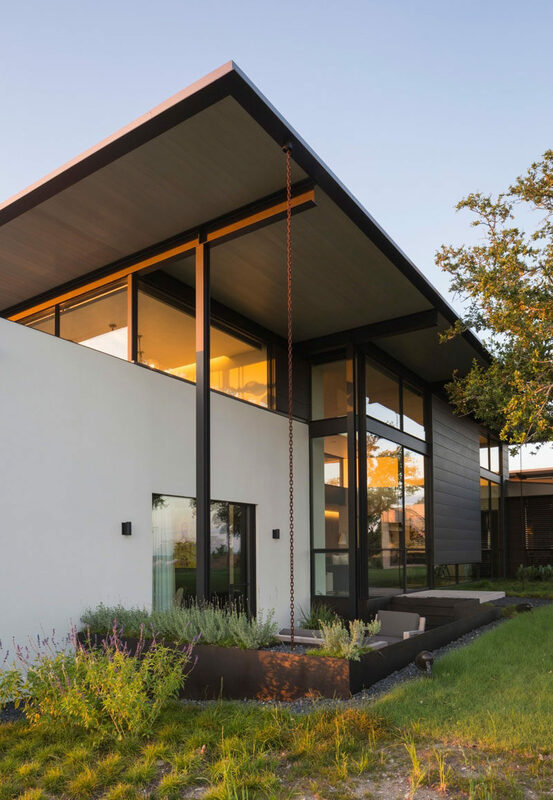 House designed by Cornerstone Architects. Photography by Andrew Pogue. 12. This thick chain sends the rain water into the planter at the base, keeping the water from collecting in unwanted places. House designed by NZ Builders Ltd. Photography by Leanna Rathkelly. 13. Chains hang from the roof of this house and flow into a hole in the cement that keeps the deck from becoming slippery when it rains. 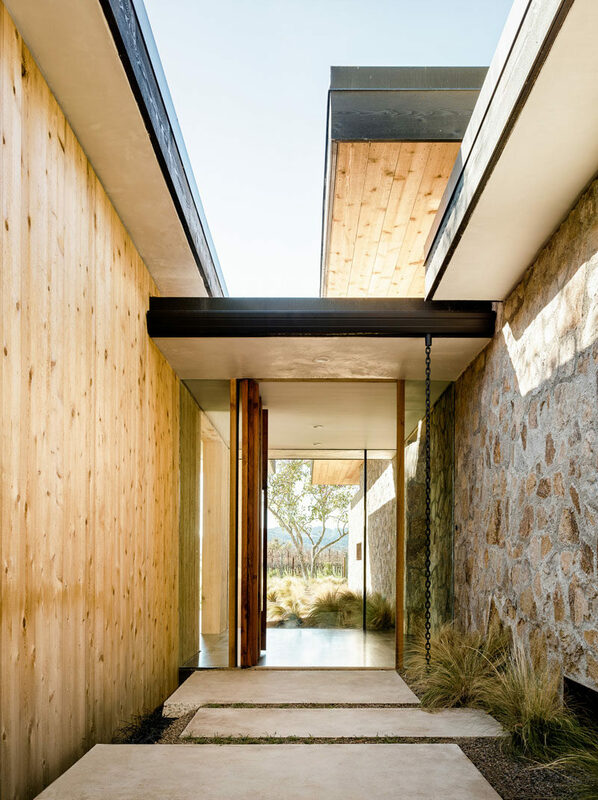 House designed by Swatt Miers. Photography by Cesar Rubio. 14. Flowers have intertwined with this rain chain and turned it into an even more unique design element on the side of this home. 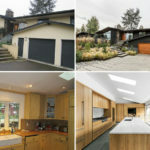 House designed by Swatt Miers. Photography by Russell Abraham.